The mini orchestra from the northeast offers a brilliant disc of and sea shanties and Americana. 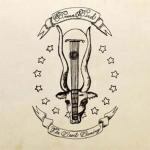 The brainchild of Dave Lamb, Brown Bird has released a brilliant album of sea shanties and Americana that swells with Appalachian undertones. Shifts in tempo not only feel like a good time but also involve a complicated modulation from one time signature to the next. Overall, the dark, dank quality of The Devil Dancing flows from one song to the next as minor chords and special guests (Micah Blue Dmaldone on upright bass and Morgan Eve Dwain and Jerusha Robinson on cello) stew in a cauldron of “muck and mire”. The disc begins with “Danger and Dread”, a soulful dirge-like song that seems to breathe in and out as the strings sway from one note to the next. “Down to the River” speeds the pace with a low-end-led frenzy. Lamb’s percussion is sparse yet perfect, and his vocals have the right amount of grit and soul of an Appalachian mountain man.